Sold. Thank you very much! 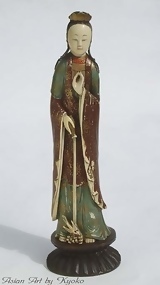 Old Chinese ivory figure of Guanyin, the Goddess of Mercy, in a refined and elegant pose. The body is made out of one piece elephant ivory and finish in a term "cold painted ivory" meaning that the color is applied without any firing to fix and harden it. This method of coloring ivory dates back to the Ming times and was particularly popular in the 18th century. This is probably 19th century piece. Her wonderfully tranquil face and the excellent painting make this a desirable piece. The dimensions of figure is 3" (width) x 9 5/8" (height) on the stand. There are wo pegs; one shown on the ivory, the other on the stand. The size of ivory is 2 1/4" (at the bottom) x 8 1/2" in height. The dimensions of case is 10 1/4" in diameter x 15" in height. Special handling chanrge applies with the shipment of glass case.